Viet Thanh Nguyen a obtenu le Prix Pulitzer 2016 pour son roman ‘The Sympathizer’, disponible en français et en anglais. Il est également l’auteur de ‘The Refugees’. 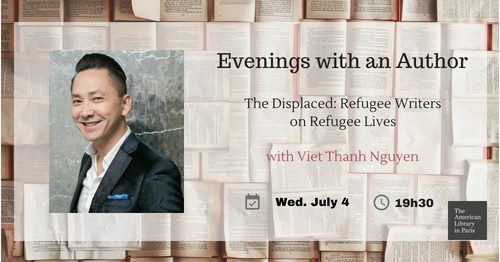 Rencontre le mercredi 4 juillet 2018 à 19h30, à l’American Library à Paris, relative à des écrits d’écrivains réfugiés sur des vies de réfugiés avec l’Américain d’origine vietnamienne Viet Thanh Nguyen, auteur du roman ‘The Sympathizer’ (Prix Pulitzer 2016) qui s’exprimera en anglais. Pulitzer Prize-winning author Viet Thanh Nguyen, the Library’s first writer-in-residence, returns to the Library to talk about his edited collection of essays The Displaced: Refugee Writers on Refugee Lives. Nguyen, himself a refugee, brings together writers originally from Mexico, Bosnia, Iran, Afghanistan, Soviet Ukraine, Hungary, Chile, Ethiopia, and others to make their stories heard. 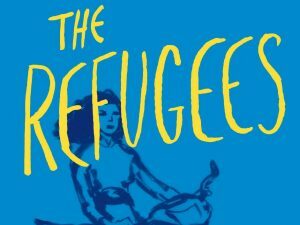 They are formidable in their own right—MacArthur Genius grant recipients, National Book Award and National Book Critics Circle Award finalists, filmmakers, speakers, lawyers, professors, and New Yorker contributors—and they are all refugees, many as children arriving in London and Toronto, Oklahoma and Minnesota, South Africa and Germany. 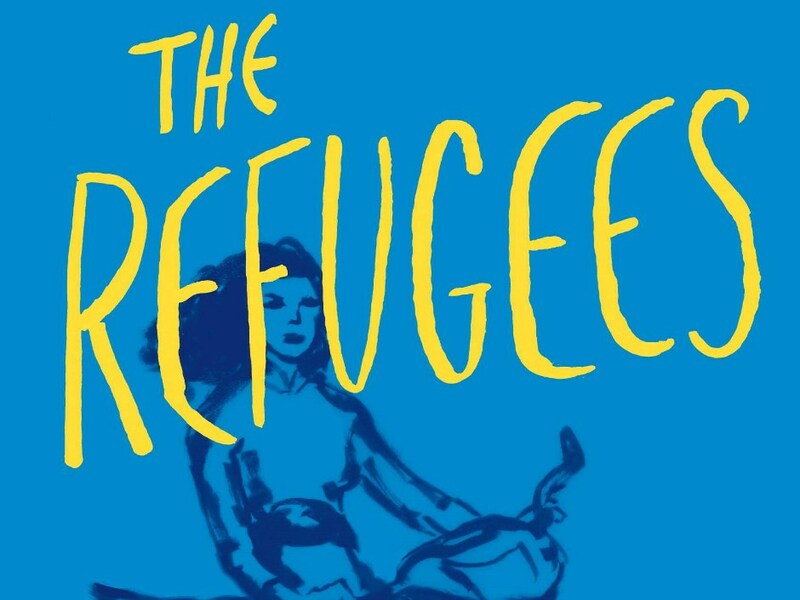 These essays reveal moments of uncertainty, resilience in the face of trauma, and a reimagining of identity, forming a compelling look at what it means to be forced to leave home and find a place of refuge. List of contributing authors for The Displaced: Joseph Azam, David Bezmozgis, Fatima Bhutto, Thi Bui, Ariel Dorfman, Lev Golinkin, Reyna Grande, Meron Hadero, Aleksandar Hemon, Joseph Kertes, Porochista Khakpour, Marina Lewycka, Maaza Mengiste, Dina Nayeri, Vu Tran, Novuyo Rosa Tshuma, and Kao Kalia Yang. 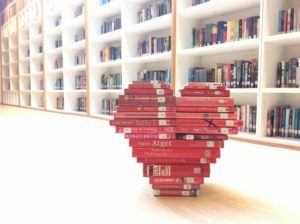 Pulitzer Prize-winning author Viet Thanh Nguyen, the Library’s first writer-in-residence, will hold a masterclass at the Library on two Sundays on 8 and 15 July. Participants are asked to read the poem “The Colonel” by Carolyn Forché, which will be used for critical analysis during the class. Nguyen will also lead a discussion on writing and publishing. There is a fee of 25€ to participate. Space is very limited. 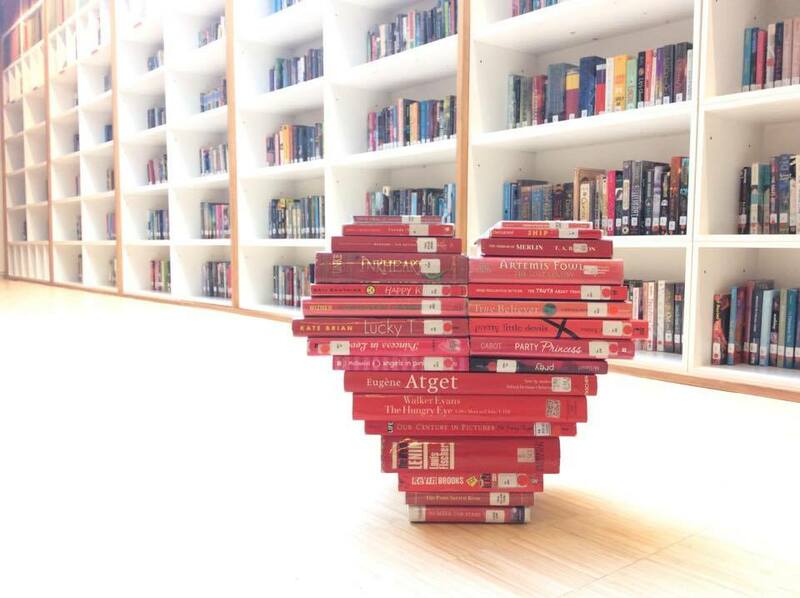 To sign-up or questions, please send an email to programs manager Grant Rosenberg at rosenberg@americanlibraryinparis.org. 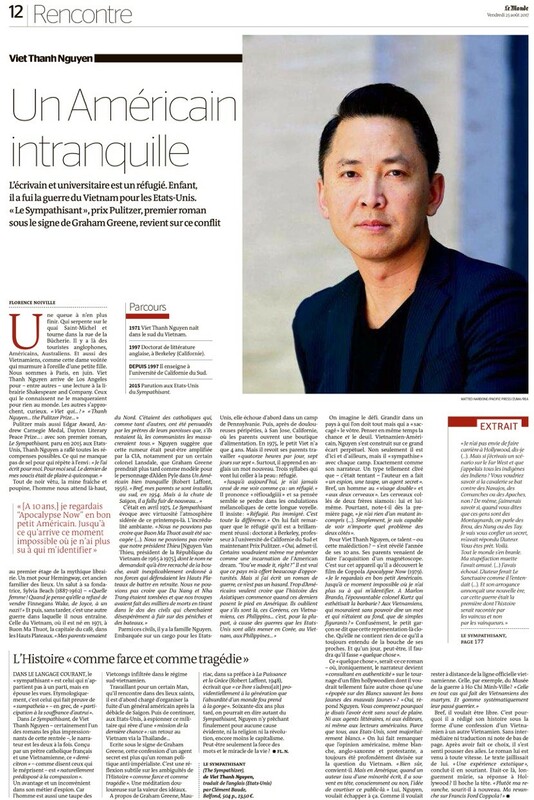 Viet Thanh Nguyen prend sa revanche sur Coppola. L’écrivain et universitaire est un réfugié. Enfant, il a fui la guerre du Vietnam pour les Etats-Unis. « Le Sympathisant », son premier roman, est l’anti-« Apocalypse Now ». L’habileté de Viet Thanh Nguyen, écrivain américain d’origine vietnamienne (il a fui son pays pour les Etats-Unis avec ses parents à 5 ans), c’est d’abord de jouer avec les genres, entre le roman d’espionnage, le roman de guerre et le roman politique. La fuite de la capitale se déroule comme un morceau épique, où la bravoure obligée de ceux qui restent ridiculise les fuyards, le Premier ministre et général de l’armée de l’air en tête, qui exhorte les soldats et les habitants à se battre jusqu’au bout tandis qu’il prend tranquillement la tangente en hélicoptère. 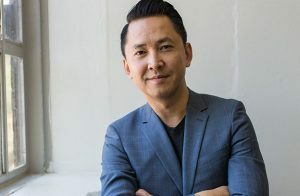 Il n’y a pas de héros chez Viet Thanh Nguyen, récompensé par le Pulitzer 2016 et le Prix du meilleur livre étranger 2017. Ni de traîtres intégraux. 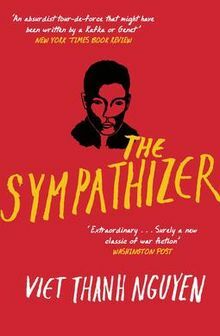 Viet Thanh Nguyen’s novel The Sympathizer is a New York Times bestseller and won the Pulitzer Prize for Fiction. Other honors include the Dayton Literary Peace Prize, the Edgar Award for Best First Novel from the Mystery Writers of America, the Andrew Carnegie Medal for Excellence in Fiction from the American Library Association, the First Novel Prize from the Center for Fiction, a Gold Medal in First Fiction from the California Book Awards, and the Asian/Pacific American Literature Award from the Asian/Pacific American Librarian Association. A French translation (Le Sympathisant) by Clément Baude was published by Éditions Belfond, and was recently awarded the French-American Foundation Translation Prize. His other books are The Refugees (a collection of short stories) and Nothing Ever Dies: Vietnam and the Memory of War (a finalist for the National Book Award in nonfiction and the National Book Critics Circle Award in General Nonfiction) and Race and Resistance: Literature and Politics in Asian America. Nguyen is the Aerol Arnold Chair of English and a Professor of English, American Studies and Ethnicity, and Comparative Literature at the University of Southern California. ← Vendredi 14 septembre 2018 de 20h à 23h, projection (suivie d’un débat) d’un documentaire sur le maître bouddhiste zen d’origine vietnamienne Thich Nhat Hanh et la communauté du village des Pruniers situé dans le sud-ouest de la France (Paris La Défense).